Reviewing books, films, video games and all things science fiction. Despite its long lauded history, there are several titles that seem to define Final Fantasy. While the others are by no means slouches in the writing or gaming department, VII, IX and X all seem to be held up as pinnacles of the series, but even beyond them we have VI. As the last hurrah of the SNES era, it was fitting that it ended on one of the biggest, broadest stories of the entire franchise, and arguably one of the best told. With that in mind however, it’s a damnable shame such a classic has been resurrected in half-baked, poorly programmed port, which pales before even the most basic ROM-hack. This is an absolute disaster, I'm stunned by how it turned out, so not only are the graphics much worse (I'm not kidding when I say that the base RPG maker has better looking presets) and the music and gameplay are far worse, but it's also much larger and more expensive. How do things like this even happen? The only one I can give any credit too is the guy who redrew the art since he seems to be the only one who tried (and only an E for effort), but as you mention those graphics don't work with the rest of... Anything. As for the reason of it, yeah, there's not much to really say. Most of the ports have been of a questionable quality but there's usually been some way to defend it worst aspects. 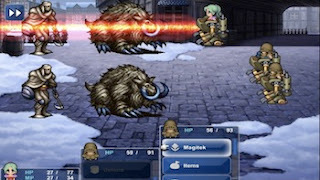 VII had additional DRM, but they kept the good timing in combat and the story was translated without any issues or determined efforts to mess with the graphics. IV had a few complaints as it was based upon the Nintendo DS version, but that at least brought with it a few good story expansions, genuinely good ones which benefited underdeveloped sub-plots or overlooked aspects of the original tale. This one, meanwhile, is just downright bad. I really hope this is a wake-up call to Square, but I doubt it. Is Batman & Robin Really Such A Bad Film? Why Are Warhammer Fans Obsessed With Malal?